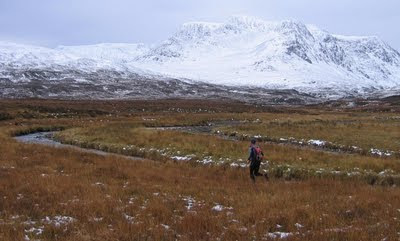 One of my first ever "ultra-distance" runs was from Dalwhinnie to Ft. William - accompanied by a chap Mike Thompson as part of our training for the West Highland Way race back in November 2008 (see photo below). 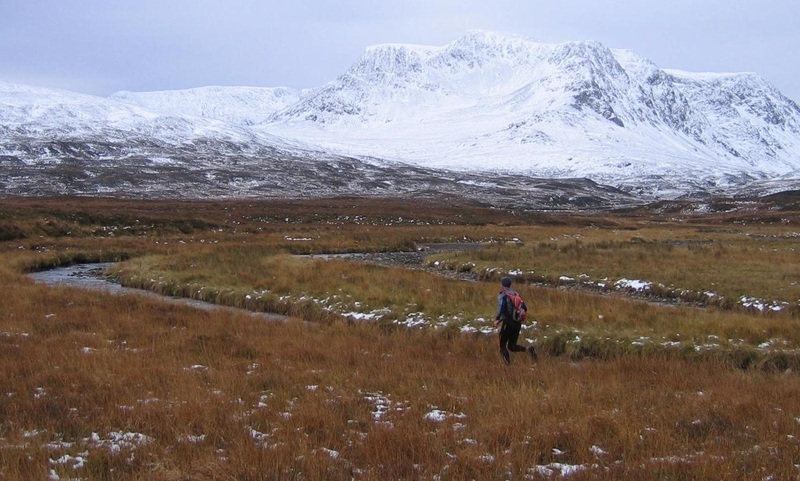 And what a fantastic introduction to long distance routes - from the very remote Ben Alder Forest to the much more populous but very scenic Glen Nevis. 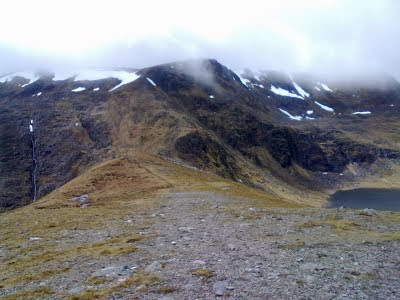 The route described in my blog below follows the same good track as far as Loch Pattack, but for added stupidity I took in the "Anoach Four" ridge of Munros to the North of the Bealach Dubh, dropped down to the Bealach then went Munro bagging again on my way down to Rannoch. 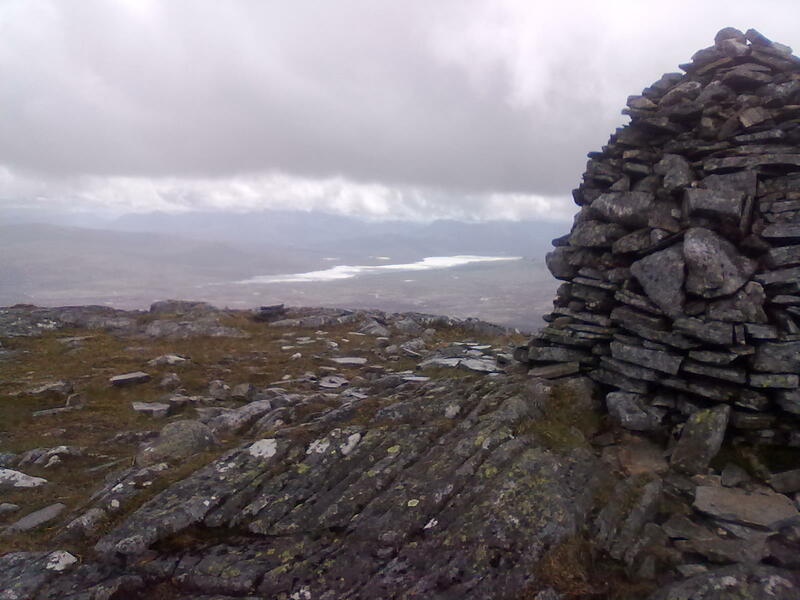 The sensible way is of course to camp or stay in Culra Bothy or Ben Alder Cottage en-route. And/or use a bicycle. Again I was teamed up with my dad for another weekend of outdoorsy madness. We drove to Pitlochry Station with unstable clouds above, as forecast, but the day promised to deliver fine views when you weren't up in the clouds, or getting soaked by every kind of precipitation known to man. Nice to meet cyclists and other walkers waiting for the train. My dad was driving off to a point near Rannoch Station, he was doing his first "Solo" climb of a Munro for years (Carn Dearg) and I was hoping to catch up with him much later on during his descent, all things going well. We had a walkie-talkie each. I was a bit confused on disembarking the train at Dalwhinnie as the sun was shining - that's not what usually happens here. Jogging back over the railway tracks and onto the NW shore of Loch Ericht, I got the much-anticipated feeling of "heading out into the wilds", and it felt damn good. Of course, the estate landy track is very much a road these days so its hardly wild at all - but as you walk, pedal or in my case run down it, you know that the place it takes you is very remote and embraced by some fine mountains and corries. The track eventually (6-7miles) climbs gently away from the loch then descends towards Loch Pattack - those not heading for the Anoach Ridge would most likely turn-off the path onto a lesser track directly towards Culra Bothy and the wonderful Bealach Dubh beyond. As I passed the curious estate ponies, I noticed the hillside beyond Loch Pattack became psychedelic. I was looking through a very low-angled rainbow - lots of sunny rain going on today. Its little credit to the imagination of those tasked with naming Scottish mountains that both my first and last hill of the day were "Carn Deargs". Red Hill. My route choice onto the ridge of Carn Dearg No. 1 was a tad unorthodox (if orthodox is defined by the SMC books or munro-bagging websites), in that I decided to abandon the track at the top of Loch Pattack and pick my way up through the heather, moving from one burn to the next trying to find the easiest ground. This worked out ok as the going wasn't too steep until higher-up, by which point I was on exposed, windclipped terrain and knew I could look forward to much easier running from then on! In theory. In practise, it was me who got windclipped, and I was very quickly putting on hat, gloves, and after spinning around like a dog chasing its tail I finally got my other arm into the goretex too. The mountain forecast had warned of extreme gales and severe windchill, and snow on the summits, and possible thunderstorms, and for the likes of me and my dad the intent of such warnings never fully sink in until we're sober and 850m up a 1100m mountain and unable to individually move our fingers. The cloud was rushing past just metres above my hood. Was I still having fun? Not as much as I had been earlier, due to a bit of dread about trying to run into that cold gale along a high-altitude ridge for the next 5 miles. I soon cheered back up again, because after ascending into the cloud, picking up traces of Munro-baggers path, then cresting the boulder-strewn summit of Carn Dearg, the cloud lifted to reveal a stunning view of Lancet Edge and Ben Alder's Short and Long Leachas, all in partial sunshine (title photo). Even the conical Schiehallion could be seen, and later today the knobbles of Glencoe - visibility was excellent between the clouds and the squalls. (Hint: Don't look for the knobbles of Glencoe on a map). I was grateful for the shelter afforded by the mass of Gael Charn ahead, so I stopped and admired the situation and enjoyed feeling my fingers again. Loch an Sgoir beneath me, Lancet Edge beyond, Long Leachas beyond that. My route ahead looked inspiring, with a narrow waterfall cutting its way down the cliff to the left like a strike of lightening, two lochan-filled corries glimmering beneath me, one to each side, and a stony ridge ahead which I was chuffed to manage to run up without resorting to a walk. 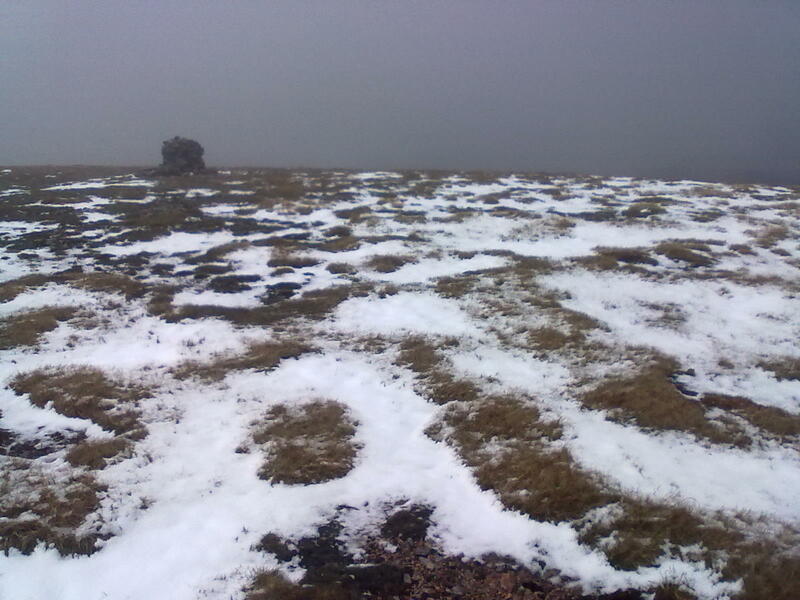 Just before I was back in the cloud I could see I was now above Lancet edge, and level with the banks of old snow. Very quickly I was upon the plateau, and glad to let the Garmin keep me on a bearing straight for the summit cairn about 1/2 mile away, surrounded by small drifts of fresh snow at 1132m. Again the cloud was kind enough to lift briefly for me, and I could see Anoach Beag ahead, and Beinn Eibhinn beyond. Fortunately the uphill bits were sheltered from that wind so it wasn't as tough as I feared, and I was getting a lot more views and sunshine than I'd expected today. 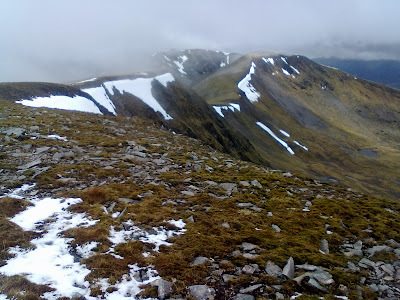 I got briefly disorientated on descending Beinn Eibhinn in cloud as the ridge curves subtly Northwards and although I'd cut off to the left I was actually still running more W, not S like I imagined. My excuse is I was too busy picking my way through the boulders! But at least I got an unexpected view of forest above Fersit and the reservior once beneath the cloud, which fortunately I recognised as not being Loch Ossian! 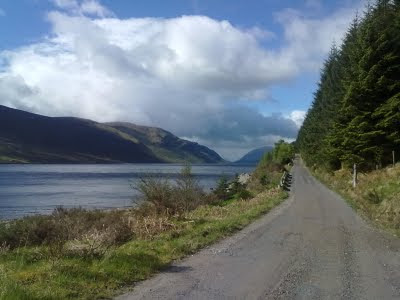 I corrected my course, apologised to my garmin for ignoring it and descended rapidly into much warmer climes of the Uisge Labhair glen. I took an overdue drink from a burn and refilled the hydration bladder from it, along with a Nuun tablet. Got down to the river, decided the best way across was to get wet feet so just waded through it then started piking my way S and SW up the hellishly heathery slopes of Sgor Choinnich. Bad route choice. I was heather bashing, and after 21miles of running I no longer had the strength to keep it going so was reduced to a walk-jog-gasp-look-at-the-scenery-a-lot-more method of progress. Once back onto the windclipped higher hillside (and putting the goretex back on as the rain came down) I was able to get into a shuffling jog again but it wasn't as enjoyable as before - I was burning fat now, and last night's bottle of Leffe. I could see Carn Dearg No. 2 in the distance. Walkie talkies work best with line-of-sight so I decided to try make contact with me dad. Contact made - he was sheltering at the summit cairn, good on him! He was also cold so he said he'd start his descent back S along the ridge towards the car parked at the base of "the Road to the Isles". It was re-assuring to make that contact though, and know we were both okay. Briefly back into cloud for the last time, I ascended the "top" of Sgor Chonnich then took a run at the shapely Sgor Gaibhre, reaching the top with relief rather than elation. Certainly felt good to be stretching the stride back out down the other side, W towards Mam Ban (thank you Wham). 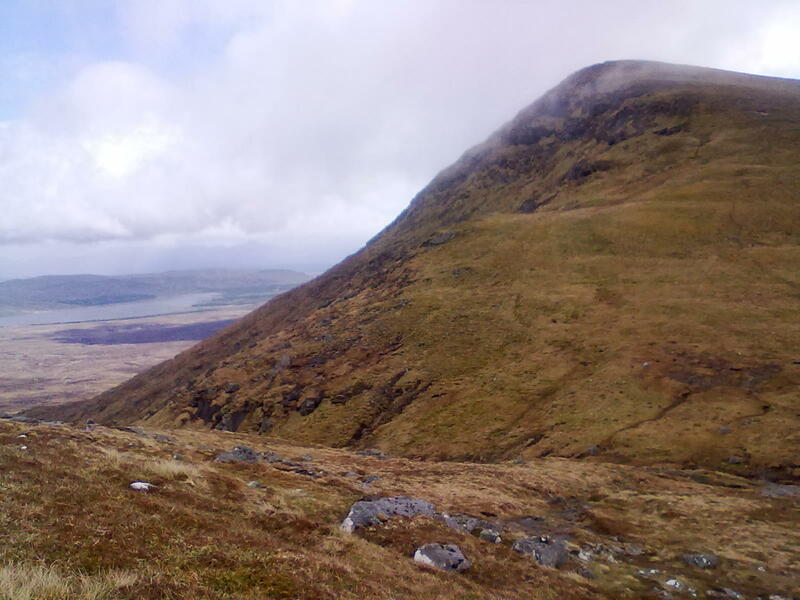 Rain showers, still accompanied by sunshine, now turned to hail as I made my way onwards to Carn Dearg No. 2 where my dad had been radioed earlier. The hail passed and it was much nicer to us from then on. I made good progress down the ridge and soon caught up with my dad, who seemed to have taken my hip injury off me. We made our way safely off the hill from there after a very long, testing, but satisfyingly adventurous day out in the Scottish wilds.